In the past, we wrote about how packing a lunch (instead of buying one) can save you some serious money. Now, Amazon is making it easier than ever to pack your own lunch by offering this huge discount on Rubbermaid Lunch Blox products! 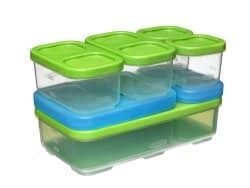 Click here to save big on Amazon Rubbermaid lunch blox items. Lunch Blox is a modular system of food storage container kits designed to keep your lunch foods fresh and tasty. They are also easily stacked in a lunchbox or bag. Amazon normally offers these items at a discounted list price. They’ve reduced these prices by as much as 40% in some cases, giving you a discount of 60% or more off the list price! That’s incredible! This sale is only good today. The items may run out of stock, in which case Amazon does NOT offer a rain check. These make wonderful back to school presents for your family. So, hurry over, and check out the bloxs.